Southerners, with their soft white flour, have had a long love affair with the biscuit, and jump on every recipe that promises to deliver the lightest, fluffiest, softest biscuit ever. 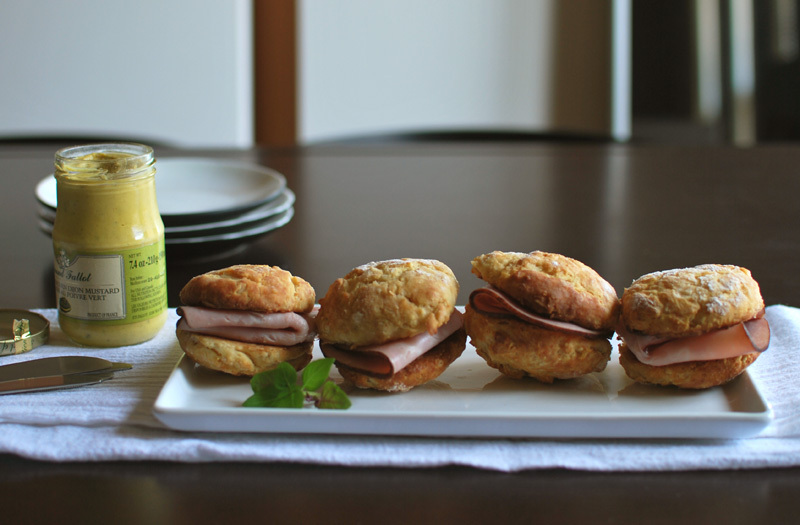 To many, myself included, there’s not a whole lot that can beat a breakfast of biscuits with slices of good ham nestled inside, perhaps with a dollop of grainy mustard. Actually, forget breakfast, that’s good any time of day. If you’re from the South, you may have heard of angel biscuits. But if you’re not, or if you somehow simply haven’t heard of them, you’ve been missing out. Angel biscuits have been floating around the South, passed from cook to cook, since at least the 1950’s, though they achieved much greater popularity after fairly widespread publication in the 1970’s. The major difference between typical biscuits and angel biscuits is the use of yeast. Yes, angel biscuits are yeasted biscuits, which means there’s actually three kinds of leavening going on: yeasted, chemical (baking soda and baking powder), and physical (steam from melting butter and shortening). With all this help, it’s no wonder they’re also known as “bride’s biscuits”, implying that even a newlywed kitchen novice could make light biscuits with this recipe. Many versions of this recipe call for active-dry yeast to be dissolved and proofed in warm water before adding to the otherwise-typical mix of cold butter, flour, and cold buttermilk. But this seems a bit counterintuitive to me; good, flaky biscuits need solid (cold) fat. If you add warm liquid to it, you’re going to melt the fat. However, yeast needs one of two things to grow: warmth or time. Considering that the intended result is a biscuit, I’m going to say that it’s more important here to keep the fat cold. In light of this, I’ve used instant yeast, which can be directly mixed into the flour, no proofing needed. Because there’s no warmth to activate it, this yeast now needs time to do its thing, hence the overnight rest after mixing the dough. Yes, I’m fully aware that an overnight rest rather negates the innate speed of a standard biscuit. But sometimes, for fluffy biscuits, we must do what we must do. Besides, you don’t actually have to rest it overnight; it’s just the best way to get the maximum lightness. Do bear in mind that this method won’t produce the flakiest biscuits ever, but it will make soft angel biscuits that justly earn their name. 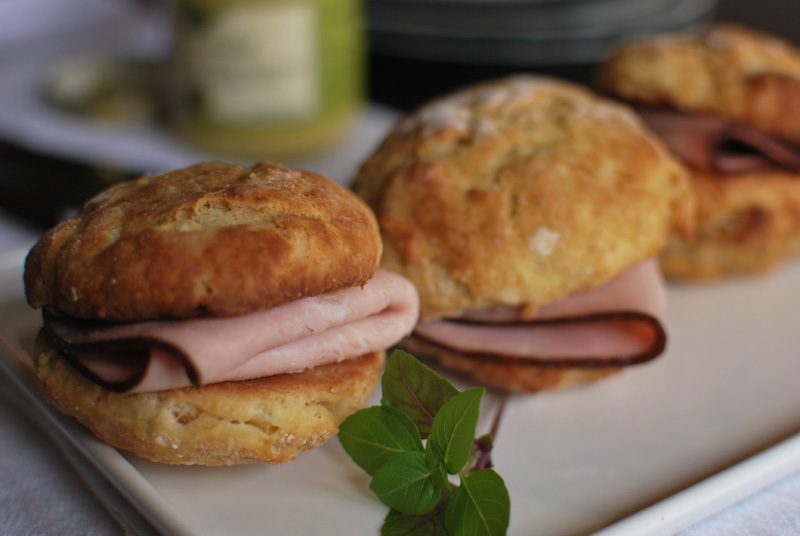 I’m certain any Southern cook would approve – especially if you serve them with a plateful of good ham! 1. Preheat oven to 425° F. Grease a large baking sheet, or line with parchment paper. Cut the butter and shortening into as small pieces as possible. Pile loosely on a small plate and freeze while preparing remaining ingredients. 2. In a large bowl, sift together the flour, yeast, sugar, baking powder, baking soda, and salt. Add partly-frozen butter and shortening. Moving quickly, toss and pinch butter and shortening into flour with fingertips, until the mixture resembles coarse meal. Large flakes or pea-sized lumps are just fine. 3. Add the buttermilk to the flour mixture, and fold quickly but gently with a fork or nonstick spatula until all dry ingredients are moistened and a rough dough forms. 4. Turn the dough out onto a floured work surface. With floured hands, press the dough together into a cohesive mass. Liberally dust the top with flour, and fold the dough in half (you may need to use a bench scraper to help with this). At this point, the dough may be refrigerated, wrapped in plastic wrap, at least 8 hours and up to 2 days. Let come to room temperature for 20 to 30 minutes before proceeding. 5. Using a rolling pin, and dusting with flour as needed to prevent sticking, gently roll the dough out to about 1/2 inch thick. Using a round cutter, and cutting decisively, cut as many biscuits as you can, cutting each out as closely as possible to the next one. Do not twist the cutter. Transfer the biscuits to the prepared baking sheet, placing them so they just touch. 6. Gather scraps together by gathering in from the sides, pressing the cut sides together. Do not re-knead or re-roll for the best results. Form biscuits from scraps either by hand-shaping or by cutting. Transfer scrap biscuits to the prepared baking sheet, placing them so they just touch. Cut-out biscuits can be frozen at this point, for up to a few weeks. Do not thaw before baking. 7. Bake biscuits at 425° F for 10 to 15 minutes (15 to 20 minutes if frozen), or until lightly browned on top. Let cool on the pan for a minute or so, then transfer biscuits to a wire rack to finish cooling. Serve warm. 1. Cooked biscuits can be stored at room temperature, wrapped tightly in aluminum foil, for 6 to 8 hours. Before serving, rewarm in a 350° F oven for 5 minutes. If not eating within that time, freeze, wrapped in foil. To serve, bake unthawed and unwrapped, for 10 minutes at 350° F.
This entry was posted in Quick Breads, Savory, Yeast Breads. Bookmark the permalink.